A premature closure of Exelon Corp.’s R.E. Ginna Nuclear Power Plant, along the south shore of Lake Ontario in New York, would have a profoundly negative economic impact on the local area, a county official recently said. The Ginna facility is at risk of premature retirement because of a perfect storm of economic challenges: a sluggish economy, historically low natural gas prices and the unintended consequences of current energy policies, the Nuclear Energy Institute (NEI) said in a February report. The town of Ontario, a small community with a population of just more than 10,000, has thrived since the Ginna plant started operation in 1970. The town receives approximately $1 million a year through a payment in lieu of taxes agreement with the plant, John Smith, of the Wayne County Board of Supervisors, told Power News Wire. Wayne County also has benefited from the plant’s contributions to property taxes as the county's largest taxpayer, which has helped support its semi-rural school district. The Ginna facility contributed more than $10 million in state and local property taxes and sales taxes in 2014, according to an NEI report. When calculating the total tax impact, the plant's operations resulted in nearly $80 million in tax revenue to the local, state and federal governments. Ginna employs approximately 700 people directly and adds another 800 to 1,000 jobs during reactor refueling outages, the NEI reported. But the bigger impact of a plant closure would be the adverse effect on the Rochester metro region, where there is at least a $350 million economic impact annually, Smith said. Ontario was hit hard by the 2008 economic downturn, like many other older industrial cities in the Northeast. But now that it is recovering, the loss of Ginna’s large tax base from salaries, and sales and property taxes would be a major setback for the town, Smith said. Residents would see a significant reduction in services. For Ontario alone, Smith said a 30 percent tax increase over several years is a reasonable estimate if the plant closes. New York is home to six nuclear reactors that supply 33 percent of the state’s electricity while emitting no greenhouse gases, the NEI said. Nuclear energy supplies approximately 60 percent of the state’s carbon-free electricity. Ginna generates about 4 percent of New York’s electricity and is licensed through 2029. The New York State Public Service Commission held a hearing this month regarding a Reliability Support Services Agreement (RSSA), which could result in the Ginna plant remaining open for the next several years, Smith said. The commission has determined there is a need for the electrical capacity generated by Ginna. Discussions surround formulating an agreement between Ginna, Exelon and Rochester Gas & Electric, a regional distribution network that purchases the majority of Ginna’s electrical output. 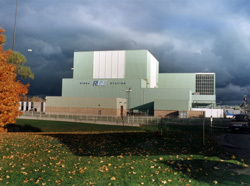 “Essentially, this RSSA would provide a level of support through the ratepayers for the plant to keep it operating and open,” Smith said, until one of two things happen: either natural gas rates return to more common trends and nuclear power can remain competitive, or RG&E can upgrade its transmission capabilities to ensure adequate power in the service region. “We’re wary of their ability in a timely fashion to adequately increase their electrical transmission capability,” he added. Smith expressed frustration over what he views as a lack of a national energy policy, and how much it impacts state and local governments. “One of their stated goals forever was nuclear is energy independence; and now that we’re really moving strongly to achieve some of those goals, all of a sudden you’re going to let a perfectly functioning, safe, licensed plant close out of a short bubble of natural gas,” he said. Once a nuclear power plant is closed, it cannot be reopened. “It is virtually impossible through regulatory and economic terms,” Smith added.